Stage Props - So Important To The Success Of A Show! Look closely at the Stage Props the next time you attend theater. Though barely noticed by many... these are the items (sights and sounds), along with the costumes, that work to transform you into the world of the characters in a script. Theatrical props set the atmosphere in which the characters exist. Just think of all the new worlds you enter when viewing your favorite plays. There is an interplay of actors, atmosphere and character which makes these other worlds come alive. Scenic designer work with the director, prop master, stage crew and entire technical team to create a special setting for each play, be it a musical or drama. Stage Props include any hand props used by the actors, the furniture, set decorations and accessories. The Prop Master is responsible for the assembly of all the props, and their placement. 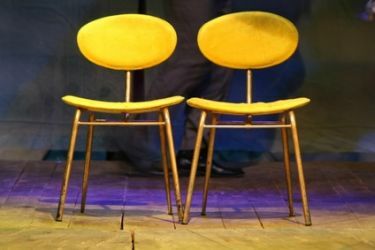 The job of the Prop Master is laden with responsibility, as a good or bad execution of the props can make or break a show. How Do I Put Together Stage Props For A Show? A few years ago, I worked on the "prop committee" of a high school musical. We were charged with gathering all of the "small props" ...such as small furniture, baskets, lamps, pictures, glasses, pizza pans, bowls, dishes, cutlery, fans, telephones, etc...anything and everything other than the scenery, costumes, and large furniture. We first met with the director, scenic designer, prop master and costumers to determine what they would need us to gather. We broke down the list into number of committee members and made each member responsible for 10-12 items. Several members were asked to engage the help of other parents, whom we knew had the skills needed to build or find what we needed. We again consulted with the director and prop mistress. In our case, the director had the last say as to what was eventually used. Once usage was established, we documented all of the pieces in a prop book which was given to the prop mistress. The prop mistress was in charge of execution of the props during the show and used the book to keep track of what was to be used. At strike, we helped to dispose of the props by storage, or return to their proper owner. We had recorded who owned what in the prop book, which made the task easy. By conducting ourselves in an orderly way, things went smoothly for our committee. My advice to anyone involved in working on props for a show is to set up an organized system, and follow it to the best of your ability. Be prepared to work hard. You will be rewarded by a well designed atmosphere in which the actors can work their magic.